Cooking with a pressure cooker is wonderful in that the magic is its quick way of cooking not having to stand over a hot stove with many pots for different ingredients for hours. Today’s pressure cookers are not the kind your grandma used. They are more safe, easy to clean, and some have digital control panels in the electric models. On-the-stove models are still made but you must watch them. Don’t be afraid to use one; just read the manufacturer’s instructions and do what is shown. A video is here for you to see by a British English speaking woman making lamb with vegetables. At the outset, never poke your meat with a fork because the sharp fork releases all the tasty juices you want to keep. Use tongs to turn meat, poultry, and seafood and a wooden spoon or paddle for stirring and flipping ingredients. Pressure Cooker Recipe – Delicious Lamb Shanks video. How Does a Pressure Cooker Work?–video. Pressure cookers prepare a stove top meal of 3 hours in about 35 minutes. That is certainly enchanting for those of us who have jobs plus more busy schedules. The wonderful thing about the cooking rack in the bottom is that it keeps quicker cooking foods out of the bottom liquid and on top. 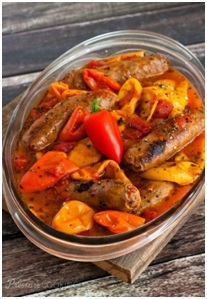 Each singular food maintains its original flavor whether it’s a one pot entrée, stew, soup, or dessert. Choose foods that take the same amount of time to cook. Potatoes in 1/2-inch slices only take 3-minutes to cook and 3/4-inch slices will take 5 minutes. You might want to leave them whole or cut in half. With a chicken taking only 8 minutes, and green beans 2 minutes, you will want your vegetables cut larger. Or you can cook the chicken first, cool the stove top cooker, remove the lid, add the vegetables, and cook a few minutes for them. 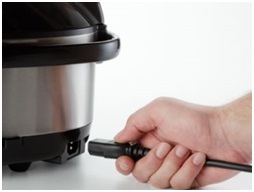 See how to use the Elite by Maxi Matic Platinum Pressure Cooker 8-Quart video. Most electric ones operate the same way. You will need less liquid when you cook under pressure; you can use more, but never less. 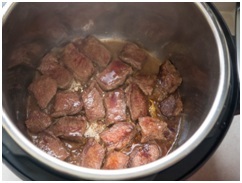 Evaporation is not so great using a pressure cooker as happens with a pot on the stove with liquid. The hot steam made from the pressure does the cooking. Use at least 1 cup of liquid that can be water, vegetable stock, meat stock, or tomato juice. Liquids should not cover the ingredients that go over half way up the pot. Steam needs room to expand. Fill it two-thirds (2/3) full of food. Fill it half full of liquid (about 1 cup). The process of cooking with pressure is easy to understand. The liquid will boil at 212-degrees F. Once that temperature is reached, you have steam. Steam can reach about 250-degrees F., much hotter than boiling water. The steam builds pressure at about 10 to 13 psi (pounds per square inch) making food cook 25 to 30% faster than regular open pot methods. Read the instructions in the manual that came with your pressure cooker. Start cooking with high heat on a stove or use the preprogrammed function on electric units with that option. With electric models, it is easy peasy! Lower the heat after it comes to pressure if you use a pressure cooker made for a stove. On a stove, if pressure drops, turn up the heat. For the best possible flavors, brown or sauté meat, onions, and garlic the same as you would in a skillet on a stove. You’ll want those brown bits on the bottom so add a little water or liquid to loosen it before adding your final liquid. This also prevents the bits from sticking or scorching on the bottom. Do this first, then add all the other vegetables, rice, and liquid. Most cookbooks cover this for desserts. However, for every 1000 feet above sea level or 2000 feet, add 5% more time to your cooking time. Potatoes at sea level take 5 minutes to cook in a pressure cooker 3/4-inch thick. At 5280 feet in parts of Colorado, it will take 2.5 minutes longer, or 7.5 minutes. Water boils at a lower temperature at high altitudes. Put the lid upside down on the bottom. Be sure to put a cloth or thick paper towels between the 2 pieces to avoid scratching and marring each piece. 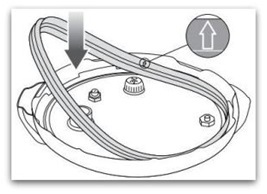 If your lid will not fit this way, leave it cocked not tightly closed for air circulation. Be sure the pot and lid are impeccably clean. Wash by hand and if you have an electric unit, do not let the plug-in get wet. Remove the gasket around the lid making sure there are no bits of food that will dry to affect the seal next time you use it. Rinse and dry well before putting it away. Be sure safety valves are clean with no obstruction. Pressure cooking can reduce some food toxins. 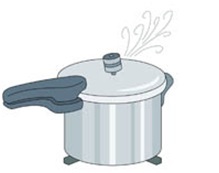 Not all food can be cooked in a pressure cooker such as cranberries, macaroni, and cereals that expand or froth, pop, and splutter that can block the steam vent. Be sure to check your User’s Manual for foods not recommended in a pressure cooker for safety.